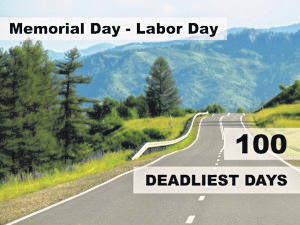 COLUMBUS — New AAA Foundation for Traffic Safety research shows an average of 10 people per day die in teen driver-related crashes during the “100 Deadliest Days”, the period between Memorial Day and Labor Day when teen driver crashes spike 14 percent compared to the rest of the year. “The number of fatal crashes involving teen drivers during the summer is an important traffic safety concern, and research shows that young drivers are at greater risk and have higher crash rates compared to older and more experienced drivers,” said Dr. David Yang, AAA Foundation for Traffic Safety executive director. In 2017, more than 12,000 Ohio teens were involved in crashes, and 38 died during the “100 Deadliest Days”, according to Ohio Department of Public Safety Crash Statistics. Nationwide, speed and nighttime driving are significant factors in teen driver crashes and fatalities. In Ohio, the hours of 9 p.m. to midnight are especially dangerous for new teen drivers, as more than 85 percent of nighttime crashes involving 16- and 17-year-old drivers during the past five years occurred between those times. Data shows a 22 percent increase in the average number of nighttime crashes per day involving teen drivers during the 100 Deadliest Days, compared to the rest of the year. AAA is leading the Ohio GDL (Graduated Driver Licensing) coalition in support of this bill. Other supporters include The Ohio Parent Teachers Association (PTA), Ohio Association of Chiefs of Police, Ohio Health, the Ohio Public Health Association, Nationwide Insurance, State Farm Insurance, along with parents and teens that testified in favor of the bill. The bill passed out of the Ohio House Transportation and Public Safety Committee in February and is awaiting a vote on the House floor. Discussing with teens early and often about the dangers of risky driving behaviors, including speeding and nighttime driving. Making a parent-teen driving agreement that sets family rules for teen drivers. Consider setting driving limits that are stronger than the state’s current law, and enforce those limits. “Through education, proper training, and involvement of parents, we can help our young drivers to become better and safer drivers, which in turn keeps the roads safer for everyone,” said Yang.